With his wild eyes and unruly mop of salt-and-pepper curls, it’s no surprise that David Edwards is often likened to the fictional, eccentric, chocolate-making genius Willy Wonka—equal parts madness and delight. From his experimental restaurant venture, Café ArtScience, in Cambridge, Massachusetts, the Harvard-professor-turned-entrepreneur is showing off a digital tap-and-sniff book for iPad while the lunch crowd inhales puffs of vaporized scotch at the bar. “Here’s Goldilocks. She’s alone in the woods, and she’s afraid!” Edwards reads theatrically as we flip through the pages. An emblem with a cartoon nose on it appears in the treetops on the page, instructing readers to tap it, which I do. The nose disappears and the message “Preparing oPhone” pops up in its place. 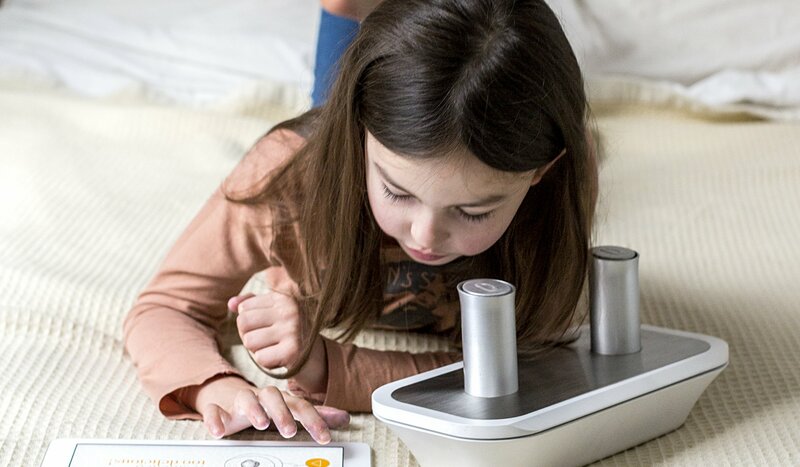 On the table in front of us, the oPhone—a smell-release system that looks like a toy boat and connects to the iPad via Bluetooth—emits a dull creaking sound before a tiny puff of air with a distinctly woodsy aroma floats out from one of its cylinders. In a few seconds, the scent is gone. Like the oPhone, Goldilocks and the Three Bears: The Smelly Version is the brainchild of Edwards and one of his former students, 24-year-old Rachel Field, who co-founded the startup Vapor Communications in 2013. The book is just the first in a series of children’s classics that will become available for iPad later this year from Melcher Media, and which was on display at the Museum of the Moving Image in New York from April to July of this year. Called Sensory Stories: An Exhibition of New Narrative Experiences, the exhibit featured technology that expands upon traditional story delivery methods and the way they play off the senses. Interactive games, films and the Google Cube—a mind-bending virtual cube that stretches a single narrative across its six faces—appeared alongside the oBook. Last year, Vapor Communications announced its oMedia platform—which it has optimistically dubbed “the iTunes of scent”—when they sent the smell of champagne and cookies from a phone in Paris to an oPhone in New York City. Since then, their photo-sharing app, oNotes (think Instagram with smell-tagging ability), launched to a modest usership—probably because the smells are accessible only with use of an accompanying oPhone, of which there are few. But all that will be changing soon: Along with oBooks, this fall the company plans to start offering an iPad case that will release up to 50 smells. Edwards declined to tell Newsweek specifically how the oCase will work, but says it will pair with odor-enhanced oGames, oMenus, oMusic playlists—they’re even working on a scent-scored oFilm with Maya Sanbar, a London-based documentary producer, who worked on 2006’s Goal Dreams and the 2008 Academy Award-nominated Trouble the Water. Edwards met Field in a class he was teaching in 2012, and he says it was her idea that set him down this path of olfactory exploration. “The idea was, What if you could have the cellphone that sends smells?” says Field. What would Instagram become if you could tack on the scent of Grandma’s gooey pecan pie or Jay Z’s sweaty T-shirt? Science has long understood that scent is strongly linked to memory and emotion, and when we send Snapchats or scroll through photo feeds, we’re missing out on important sensorial information. The technology to capture a scent with a phone isn’t there yet, but Fields says they won’t stop ’til they get there. This isn’t the first time techies have attempted to incorporate the olfactory into entertainment. “Smellies” were born in 1933, when film producer Arthur Mayer installed a scent-delivery machine in Paramount’s Rialto Theater in New York City. Unfortunately, it was impossible to clear the aromas once they were emitted, and the experiment was quickly abandoned. Nearly 30 years later, the ill-fated Smell-O-Vision made its debut with the gimmicky murder-caper Scent of Mystery. Producer Mike Todd Jr. teamed up with Swiss inventor Hans Laube, who had presented his elaborate scent-release system at the 1939 New York World’s Fair. In 1969, they unveiled the improved invention, which they called “smell brain,” at Scent of Mystery showings in three cities. Aromas of wine, pipe tobacco and train exhaust were delivered through tiny tubes to moviegoers’ seats, but it failed to be the sensory extravaganza they had in mind: Scent particles linger, they blend, they stick to clothes and upholstery. And lest we forget, there was John Waters’s scratch-and-sniff homage to Smell-O-Vision: Odorama, which had its debut and swan song in the 1981 cult favorite Polyester. In 2010, Time named Smell-O-Vision one of the 50 worst inventions of all time. Still, the oPlatform could end up being just another digital distraction from our physical environment. Will tagging the scent of ocean air really make us put down our phones and run carefree into the surf? The oNotes app, though still only used by a small community of early adopters, is already flooded with scent-tagged selfies. A smiling teenage girl with notes of “saffron” and “strawberry,” a 20-something hipster who thinks he smells like “rain.” Fields admits that “smelfies” were a pleasant surprise. Could oMedia’s use as an oddly personal product help it survive in the smell-entertainment market where all others have failed? It certainly looks promising: Our selfie-obsessed culture might be perfectly poised to exploit the last untapped sense when it comes to media—social and otherwise. But only the nose knows for sure.